There’s further action on securing the ongoing waste disposal needs of the shire, with construction of the second landfill cell at the Wanatta Lane Central Waste Facility nearing completion. The $1.2 million project meets EPA license requirements and is industry best practice for lined landfill cells. 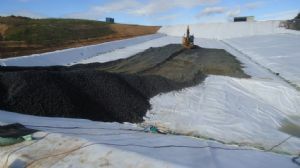 The liner system consists of a geosynthetic clay liner, overlaid by a high density polyethylene sheet, then a protective layer of geotextile, along with a layer of drainage aggregate and then a final layer of geotextile. Cell one at the Wolumla site came on line in 2013 with a life span of two years, this new cell has a life of over four years. Once cell two is operational cell one will be capped and revegetated. “The installation of a leachate collection system and extension of the access road with associated storm water drainage works have also been a part of the project,” Mr Browne says. Whelans Group Investments from Bairnsdale was awarded the contract to construct the second cell and commenced work in September 2015. Photograph: Installation of the liner system in progress in the new Central Waste Facility landfill cell.